A couple of weeks a go, during a small social gathering at a friend’s house, conversation turned (as it so often does with me) to bad music. During that conversation I was reminded of a record that, I believed, I had featured here years ago. I was amazed to discover that, in fact, I had not. So, it’s time to put that right. 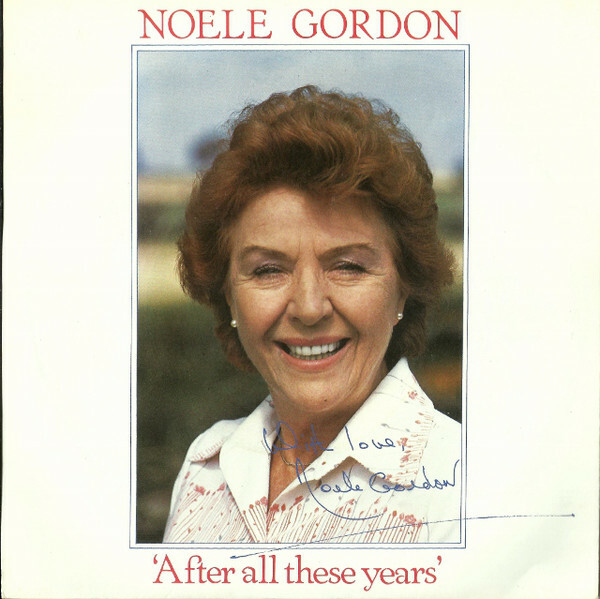 Noele Gordon will be best known to British readers for playing the part of Meg Mortimer (nee Richardson), the imperious owner of the eponymous Motel in the long-running soap opera Crossroads. A trained dancer, Joan Noele Gordon (she got her middle name because she was born on Christmas Day, 1919) first appeared on the screen in 1945, in the British film 29 Acacia Avenue. She was also the first woman to ever appear on colour television in the UK, appearing in several tests made by the BBC in the 1940s. Stage success followed (she was in the London cast of Brigadoon) before, in 1955, she joined the fledgling Independent Televison network, first as a presenter for Associated Television’s first-ever programme, The Weekend Show before helping launch ATV Midlands in 1956. For the best part of a decade she worked both as an on-screen presenter and, behind the scenes, as a producer. Then, in 1964, Crossroads was launched. The character of Meg Richardson, head of the family-run motel, was created especially for her. Crossroads was famed for its wobbly sets and ridiculous storylines: many of the earlier episodes were broadcast live, and the acting often left a lot to be desired. However the show was enormously popular with viewers, and Noele went on to win the TV Times award for most popular television actress on eight occasions. Her sacking came about while ATV was being restructured (it became Central TV on 1 January 1982). The programme was an embarrassment: network bosses hoped that audiences would abandon the show and they could cancel it. Bizarrely that didn’t happen, and it limped on for several more years. But anyway: the music. Noele (or Nolly as her friend Larry Grayson would always refer to her) left us with several classically awful recordings. A few of the stage shows she appeared in have associated ‘original cast’ releases, but it is her solo discography I wish to celebrate today. It began in 1974 with the diabolically awful To My Daughter, issued on Jonathan King’s UK record label. Luckily for those of a nervous disposition, she did not appear on the disc’s b-side. To My Daughter is diabolical: a spoken word atrocity in which the unmarried Noele waxes lyrically about a baby girl born eight-weeks premature. It’s brilliantly bad. Shortly after a whole album of Noele doing her best Barbara Cartland impersonation appeared. Noele Gordon Sings features the great woman massacring such classics as These Foolish Things and The Nearness of You, and her on-screen marriage to Hugh Mortimer (played by John Bentley) resulted in an album’s worth of nonsense, sold to viewers as the Crossroads Wedding Party. Mixed up with tracks by Stephanie de Sykes, duets with Bentley, medleys from the Crossroads cast and (naturally) the theme to the show itself, were highlights from the show’s wedding service. It’s a camp classic. Noele’s recording career ended the same year as her Crossroads career did, with the 45 After All These Years/Goodbye. A quick attempt to cash in on the publicity around her sacking, it sank without troubling the charts. Here, for your delectation, are a couple of cuts from Noele, her first single To My Daughter, and her last one, Goodbye. I’ll rip After All These Years when my copy (purchased this morning from Discogs) arrives and add that later! I was blissfully unaware of the tracks in today’s selection, until WWR regular Nigel Richardson alerted me to one and, like the Alice down the rabbit hole, I became lost in an alternate universe. I was a little surprised to discover that I had not blogged about American record producer and record label owner Shelby Singleton before, especially when I have written several pieces on his contemporary, Major Bill Smith. Smith, producer of the Legendary Stardust Cowboy, was the man who brought the original version of Hey Paula to Singleton (on Smith’s LeCam label); Singleton then reissued the disc through Philips and an international hit was born. At the age of 17 he married his first wife: Margaret was just 13 at the time. It seems highly appropriate then that he went on to produce (and, through his acquisition of Sun, control much of the back catalogue of) that other celebrity child-marrier Jerry Lee Lewis. After serving in the US Marine Corps in Korea (he was wounded and spent the rest of his life with a metal plate in his head), Singleton worked in a munitions company before being hired to promote the country music catalogue of Starday Records. Starday was distributed by Mercury Records, and when that deal came to an end he moved over to the larger company. Throughout his career Singleton exhibited an unusual flair for picking hit novelty records, including Ray Stevens’ Ahab the Arab, and he was also involved in the careers of Roger Miller, George Jones, Faron Young and many others. In 1966, after eight years with Mercury, Singleton branched out on his own, forming several music labels, including SSS International and Plantation Records. Two years later he was rewarded when Jeannie C. Riley’s recording of Harper Valley PTA went to Number One (remember that title: it’ll come in handy later!) In 1969 he purchased Sun Records from Sam Phillips, including its rock and roll catalogue. But it’s Plantation we want to look at today. Plantation was an odd label, and a place where pretty much anything went. It’s a company that is impossible to categorise, with everything from space-age pop instrumentals to political polemics, with a dash of yodeling CB/trucker trash thrown in for good measure. Here are just a few of the many oddities. 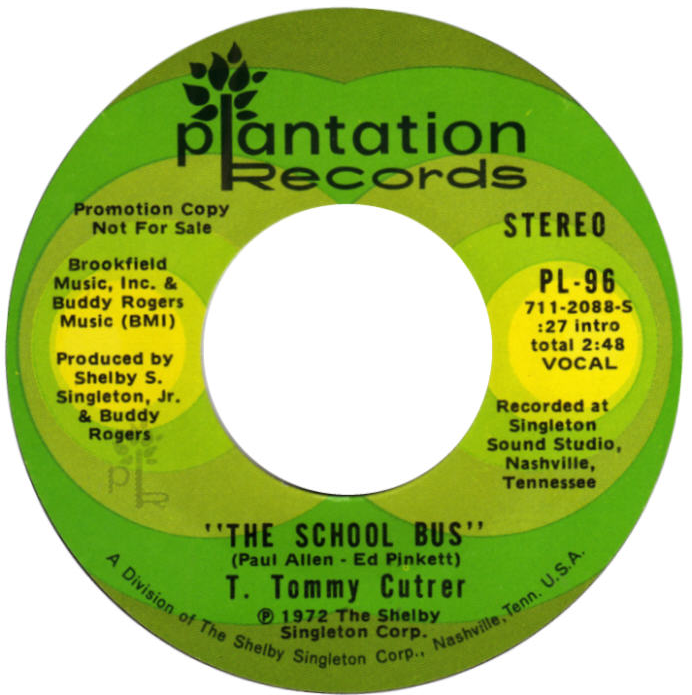 First up – and the song that took me down that rabbit hole in the first place - is The School Bus by T. Tommy Cutrer. Cutrer was a DJ and television presenter who also cut a number of rock and roll sides for, among others, RCA and Dot. 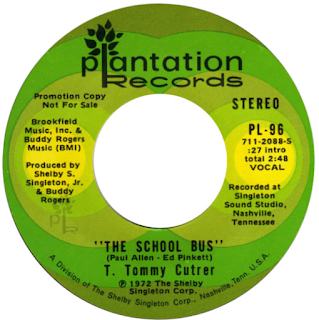 Cutrer had also recorded for Starday (as T. Tommy “the Big Daddy”) when Singleton was working for the company. However his one-off 45 for Plantation, The School Bus, defies belief. Make of it what you well. Is it pro-segregation? It’s certainly anti-government, and utterly horrible. Johnny Moore’s Sold to the Highest Bidder starts off as your typical country tearjerker, but 22 seconds in it turns in to a real-live action, presided over by real-live auctioneer Colonel Tex Herring. Odd doesn’t begin to describe it. Finally, here’s a cover of Singleton’s biggest hit, Harper Valley PTA, re-imagined in ‘comedy’ Chinaman style as Happy Valley CIA by Ray “Wong” Riley. Wong? It’s just wrong, on so many levels. Saki to me! 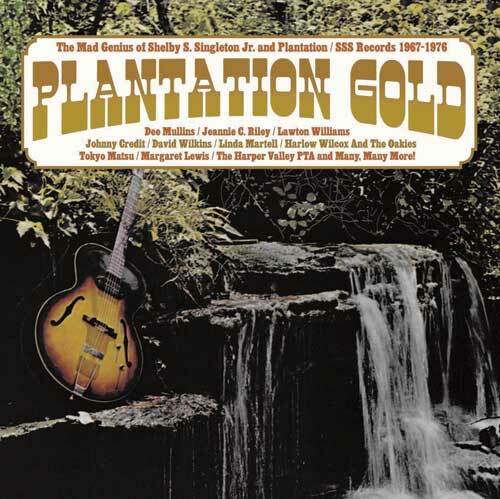 If you want to hear more I can highly recommend the two disc, 58 track collection called Plantation Gold: The Mad Genius Of Shelby Singleton Jr. via Australia’s Omni Records. The Nashville-based Singleton died, aged 77, on 7 October 2009, following a battle with brain cancer. Several years earlier he had been arrested for growing a 14ft marijuana plant, the biggest that narcotics officers had ever seen. Naomi Campbell: superstar. One of the original super models (although I’m sure Janice Dickinson would argue that one), she’s an infamous diva, a former drug addict and, apparently, a bit of a bully (with a spot of community service to show for it). Oh… and she also released an album. First issued in 1994, Naomi Campbell’s Babywoman is regularly ridiculed as one of the worst albums ever. The album was a commercial flop here in the UK, although it did better in some other countries (especially in Japan) and has sold over a million worldwide. Not bad. It was not her first foray in to the music biz: three years earlier she had appeared on the lead track to the Vanilla Ice flop film (and soundtrack album) Cool as Ice (Everybody Get Loose). To be honest, it’s not as awful as it could be. Helped by a stellar line up of guest musicians, writers and producers (including Chrissie Hynde, Luther Vandross, PM Dawn, bits of it are passable pop of the period. The Millie Jackson-esque photo adorning the front is a nice piece of self-depreciation. But it is seriously patchy, and that’s not helped by having eight different producers and using six different studios to record in. Opener Love and Tears (a Top 40 hit in the UK) starts off ok, with Naomi’s breathy vocals luring you in. Co-written by Bomb the Bass’s Tim Simenon and Gavin Friday of the Virgin Prunes, this really doesn’t sound too bad, you reason. In all fairness Naomi’s years of stage training (her mother was a dancer, and from the age of three, Campbell attended the Barbara Speake Stage School and, later, the Italia Conti Academy of Theatre Arts) mean that she knows how to sing, even if she’s not a ‘natural’. The reviewers were probably just being snobbish. But then she starts to shout. Well, bray like a sick donkey would be a better description. The voice that tempted you in over the first verse goes to pieces, and by 3:45 - when she mangles ‘tee-hee-hee-hears’ it’s all over. Her cover of Marc Bolan’s Ride a White Swan is truly horrific. She sounds like a a million other women attempting the song at a karaoke session after a particularly hard-drinking weekend. It’s given a vaguely trip-hop sheen by producer Youth - whose credits include Killing Joke, The Fireman (with Paul McCartney), Kate Bush, Bananarama, The Orb, Pink Floyd and Yazz – but, and let’s be honest here, it’s dreadful, as most vanity projects usually are. Campbell once made headlines for hitting her maid in the head with a mobile phone; after listening to this you’ll wish that the offending instrument had been travelling in the opposite direction. Back in November 2014 I featured a disc that, at the time, I raved about being quite possibly the worst thing I had ever heard in my life, a single by Father Francis the Singing Franciscan Monk. Diabolical, it was. Truly horrible. Well, while recently trawling the net I cam across a veritable goldmine of Father Francis albums for sale, and I can tell you from experience that once you have gone down that particular rabbit hole there’s no return. You see, Father Francis has released 41 – yes, 41 – albums. And then there’s the DVDs, the joke books, the Father Francis tea towel… He also likes to crochet, and Dr Who fans can by a Tom Baker scarf, hand crocheted by their favourite Franciscan, for just £9 (plus P&P) from his website. But let’s put the Catholic homeware aside for a moment, as were here to talk about the music. Father Francis’s take on the John Lennon classic Imagine comes from his 31st album, Ave Maria. I cannot imagine (if you’ll excuse the pun) how this came about. There’s no way that the Lennon Estate would have ever given permission for Father Francis to change the lyrics of Lennon’s anti-religion epic in to this anodyne paean. It defies belief. Every line, every message, every single sentiment in the original has been twisted. ‘Imagine there’s no heaven’ becomes ‘Imagine there’s a heaven’; ‘No hell below us, above us only sky’ becomes ‘there’s a hell below us, you’d better choose before you die’. It’s simply abominable. And while we’re on the subject, Father, why is it ‘Imagine there’s a heaven’ anyway? Surely if you believe ion such things then there’s no ‘imagine’ about it at all? The album also includes such perverse covers as I Just Called to Say I Love You, Sylvia’s Mother and The Living Years. This is hateful stuff… although the contrarian in me would simply love to hear Father Francis tackle a whole album of Andy Partridge’s atheistic compositions. ‘Dear God, glad you got my letter, thank you for making it all better down here… We all need another 10p on a pint of beer…’ And I need to buy a copy of his album of Abba covers, Thank You For the Music, if just to hear what he makes of Does Your Mother Know. The good Father is still preaching today, and still doing good works: he’s particularly interested in helping raise funds for starving children (and that’s a very good thing indeed). In fact he seems like just the kind of priest you’d hope for: humble, wise and kind. It’s just a shame he feels the need to perform musical transubstantiation in this way. Anyway, here’s two cuts from Ave Maria, Imagine and He’s My Forever Friend. 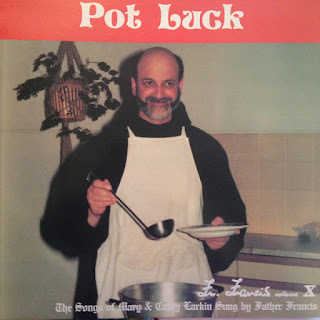 And yes, I know it’s the wrong cover image (above) but the sleeve of Pot Luck is so ridiculous that I just had to share it.